Is it possible to write a book in more than one language? And it is it a good idea? Also, would a kid’s book which makes use of a seamless plaiting of two languages work? Starting with the second question, there'll always be the purists who will frown on using more than one language. At the same time, using more than one language (simultaneously) is part of SA reality. In Johannesburg and other cities, people frequently switch from one language to another in telling a story. They also switch between languages in the same sentence. As South Africans when we hear such mixing, we don’t fall over in shock; instead, we hardly bat an eyelid. And thus, mirroring this reality, we have language mixing in poems; we encounter it on the theatre stage and we have the phenomenon of 'Scamto'. So, of course, let's welcome a children’s book in more than one language (in the same book). This is just what Cover2Cover books have done. It has published Halala Winner, a 40-page story book, most likely targeted at kids in the first three grades of school. The writer is Jabulani Kunye. In the story, Sibulele ─ an endearing boy with a big heart ─ starts at a new school, the typical story of the new kid on the playground overlaid with a ‘Jim Comes to Big City’ angle. He is teased for sounding different and because he comes from out of town. The “Funky Boys” turn up the heat also, demanding that he brings some lunch for them each day. He is sad but ─ with the help of his friend Anele ─ sticks it out. In the end, an opportunity arises where he can show one of his skills, and through it, rescue another schoolboy. He is carried shoulder high by other learners, and indications are that he will no longer be an outsider at the school nor an easy target for the bully boys. This is more than an illustrated story; using a cartoon style of drawing, it is a picture book complete with speech bubbles, thought balloons and some exaggerated action shots. The fact that the drawings so closely track the ‘action’ helps the reader understand unfamiliar words. In addition, the broad framework (the action and the plot) carry the reader forward, providing a context in which the reader can figure out what new words mean. Halala Winner shows it can be done: it is possible to deploy a mix of languages (in the same text) to tell great kids’ stories. With it, Cover2Cover seems to be testing the waters – seeing how the idea works with and how it is received by wider audiences. According to the publisher's notes, Halala is part of a series (titled My World, My Words) that “celebrate(s) the multilingual realities of most South Africans.” Cover2Cover says the stories are developed with the input of young people. It refers the way it uses languages in these children’s books as translanguaging, a good term for academics but an awful term for the rest of us. 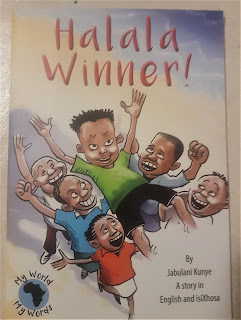 If Halala Winner is anything to go by, we can look forward to more relevant and entertaining stories in the series.